At 121 personal training we also provide private yoga lessons, nutrition coaching and massage treatments at home. Our team of top yoga teachers are available for private yoga lessons in a wide range of yoga styles – all in the comfort of your own home at times to suit you. 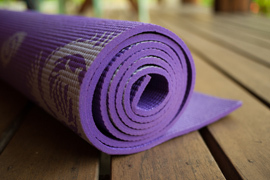 Private yoga lessons at home – contact us today to book your trial yoga lesson! Yoga works the entire body, improving posture, mobility, focus and concentration, and increasing strength and flexibility. Does the thought of a group yoga class scare you stiff? Is your work schedule making it hard for you to find the time to get to a yoga class and back? Do you want to get fit but suffer from an injury, illness or medical condition that makes it difficult for you to leave the house? Are you a busy mum who would prefer to practice at home rather than having to make complicated childcare arrangements? Do you want to improve your health and reduce stress levels to a minimum? Yoga at home is the perfect way to ease yourself back into an active lifestyle, under the guidance of our qualified and insured yoga teachers. Create more time for yourself – get the yoga class delivered to your door. Take advantage of our great value yoga deals and share your private yoga lessons with a friend or family member at no additional cost – practicing this way can work out better value than attending a crowded class miles from your home! Contact us today to book your trial yoga lesson at home! We provide nutrition coaching in a simple, easy to understand way. In just one personal nutrition coaching session, your nutrition coach will teach you how to make realistic and achievable nutritional changes to benefit your health. A few small changes can make a big difference in terms of general health, energy levels and weight loss. We offer massage treatments which allow busy people the chance to relax and unwind in the comfort of their own homes. Your therapist will visit you and will bring a portable massage table plus fresh towels and essential oils for your treatment. We provide a range of relaxing, deep tissue or sports injury massage treatments which can be booked as individual one hour visits. Earlsfield, Fulham, Putney, Putney Bridge, Southfields, Wandsworth, Wimbledon, Wimbledon Park and Wimbledon Village. We plan around your schedule and find times to suit your work and family commitments. Share your yoga lessons with a friend or family member at no extra cost!